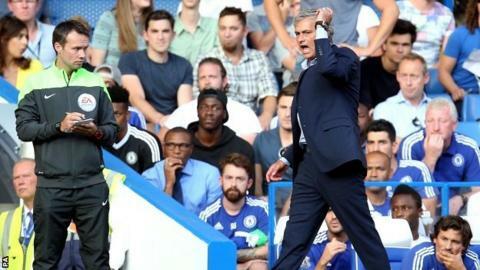 Chelsea boss Jose Mourinho criticised his "naive" medical staff for treating Eden Hazard in their draw with Swansea. The Blues, who had keeper Thibaut Courtois sent off, were down to nine men for a period after staff ran on to treat Hazard following a trip, despite him not appearing to be badly injured. If a player receives treatment, they must leave the field. "I was unhappy with my medical staff. They were impulsive and naive," Mourinho told Sky Sports. "Whether you are a kit man, doctor or secretary on the bench you have to understand the game. "You have to know you have one player less and to assist a player you must be sure he has a serious problem. I was sure Eden did not have a serious problem. He had a knock. He was tired." Chelsea were already struggling to cope against Swansea's extra man before Hazard was tripped by Gylfi Sigurdsson with six minutes remaining, leading to Mourinho's frustration. It was an eventful match for Premier League champions Chelsea. Courtois suffered an injury scare in the warm-up before he was was dismissed in the 52nd minute after bringing down Swansea striker Bafetimbi Gomis. Replacement goalkeeper Asmir Begovic came on for his debut after an £8m move from Stoke, with opening goalscorer Oscar making way. Gomis scored the resulting penalty. "I don't want to talk about it," Mourinho said of the referee's decision. After Oscar's opener, Andre Ayew equalised on his Swansea debut but the visitors only held on for 95 seconds before Federico Fernandez scored an unfortunate own goal to gift Chelsea a 2-1 lead. Following defeat by Arsenal in last Sunday's Community Shield, Chelsea again looked rusty, having returned from a pre-season tour of North America where they travelled 9,800 miles. Mourinho said: "Swansea didn't have chances against 11 men. The team was playing very, very well in the first half. "In one minute, it was a penalty, red card and the goal. "If you have 10 men and are winning you can defend well and try to find a strategy but to play with 10 men and try to win the game is more difficult. I would say we were the best team with 11 players and with 10 we fought hard, some fighting at the limit of their condition." Chelsea travel to face Manchester City in their next game on Sunday, 16 August. Who's on first on Match of the Day?